If you are a beginning pie baker, or just switching from highly refined white flour to whole grain, you may find baking with whole wheat flour a little daunting. I’m here to prove to you that a delectable, tender whole wheat crust is within your reach. 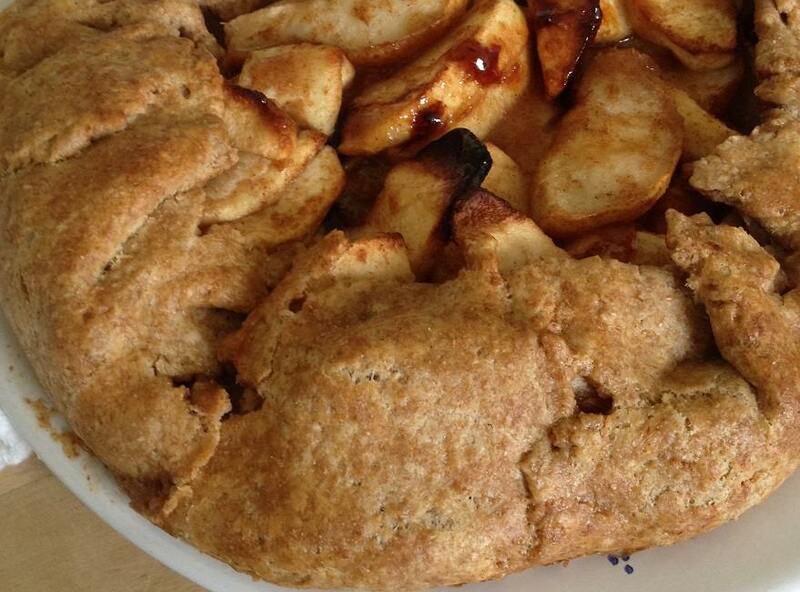 Doesn’t this rustic apple galette look good? You can almost feel the buttery crust crumbling on your tongue. This is the tutorial I wish I’d had when I was a young bride, making her first whole wheat pie crusts. Then, my pies came out tough and heavy. You needed a knife to cut a bite! After awhile, I stopped baking pies, leaving those treats to the expertise of my mom, who can throw together a white-flour pie crust in minutes, and to my then mother-in-law, who made the best pies I ever tasted, but also white flour. Years later, living nowhere near Mom, and my mother-in-law long gone, rest her dear soul, I had no one to bake the pies we enjoyed so much on holidays and special occasions. I had to learn! Surely there was a way to get the flaky, tender pastry I craved using the whole wheat flour we loved. Experimenting through the years, I tried dozens of “no-fail” recipes. All failed. Some spectacularly. Then one day, success. Not only success, but success I could repeat, time and again. Finally! I had a recipe and a method that worked. The final recipe and method may be my own, as I write it here, but it’s thanks to all the cooks along the way, in print and in their own kitchens, who showed me how they did it, that I finally found a way to make this delectable crust. 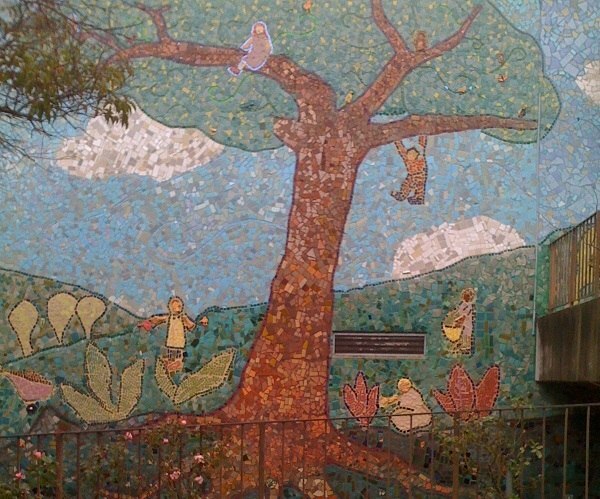 They shared what worked for them, and now, with deepest gratitude, I share what works for me. I hope this tutorial flattens your learning curve a little. 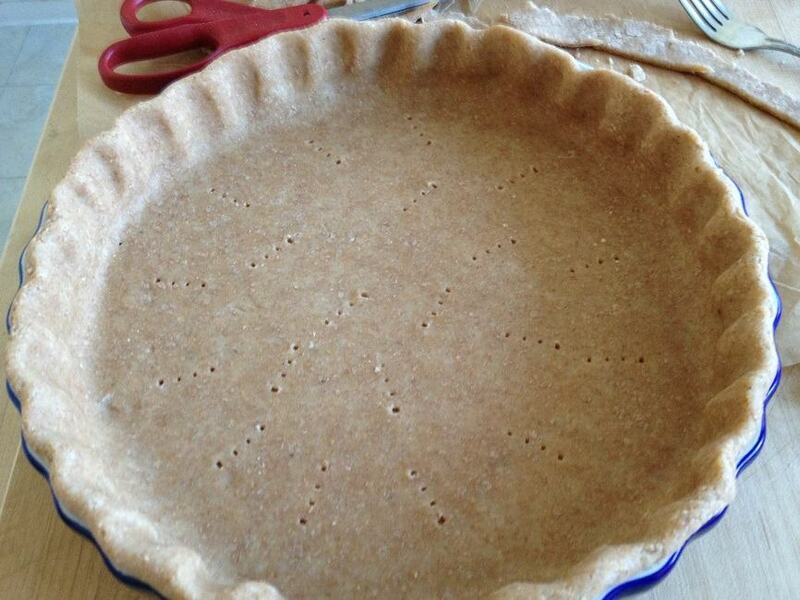 We will work from my own Tender, Flaky Delicious Whole Wheat Pie Crust recipe. I recommend it, but if you have one you know you love, and need some help making it just a little more tender, flaky and overall scrumptious, these tips and tricks might help. Welcome to Whole Wheat Pie Crust 101. Yes, this crust is easy to make. Follow the steps, and don’t be afraid to make mistakes. Pie crust is fairly forgiving. 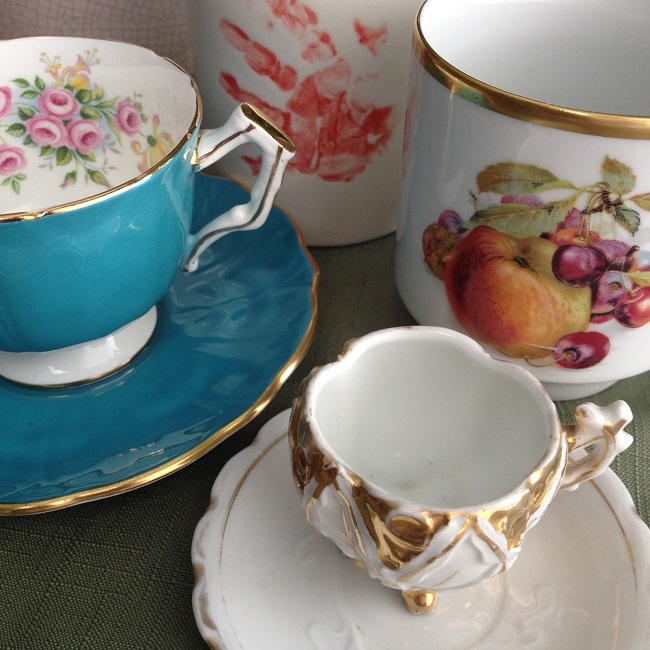 If you tear it, patch the pieces together and your guests will never notice. With practice, you’ll learn how to roll out a crust and lift it into a pie plate like a pro. The more pies and pastries you make, the more your hands, eyes, and in my opinion, heart understand the living thing that is whole grain flour. Turning out a good whole wheat pastry every time depends a bit on familiarity–getting a feel for how the flour is going to work in the dough. That’s because whole wheat, unlike highly processed white flour, doesn’t behave the same every time you measure it into your mixing bowl. Temperature, humidity and a host of factors beyond our control–from growing to harvesting to milling–add up to subtle changes in each bag of flour. Those subtle changes can make a big difference in outcome. Here’s why. White flour is fluffy because millers remove all but the finest, softest bits. Then the manufacturers bleach the flour to make it white. But they don’t stop there. Next, they add chemicals to make the flour behave the same every time you scoop a cup, no matter the weather or how the wheat was grown and harvested. Whole wheat flour is a different animal, er, product, altogether. First of all, it’s unrefined. There’s nothing in that bag but wholesome, ground wheat berries with all their parts. No bleach. No additives to make the flour behave the same on hot humid days as it does on cold, dry ones. No chemicals to help it respond well to leavening agents. Of course, one reason we whole-grain foodies prefer whole wheat is that we want to avoid all those yucky additives in refined flour. Without them, though, our flour is far less predictable–a changeable thing. That’s why practice is so important. Through experience, you will begin to feel whether the dough is too wet or too dry, when it needs a little more liquid and when not, when it is ready to roll, and when it needs a little more working, or a good chill. So be patient with yourself and your pies. 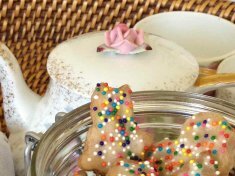 Make a few, leading up to the big holiday or event. Above all, find ways to make pie-making day fun. When working with dough, get into a rhythm, kind of like a slow dance, or a meditation. One of the joys I find in baking is the feeling that enters my fingertips when I work with whole wheat. That feeling flows all the way up to my heart and mind. It’s more than a sensation. More of a body-mind understanding that the wheat and the dough is, well, alive. That’s the only way I know to express it. This is something I never felt working with white flour. So make it fun. We really are playing with our food! All right. Enough with the preliminaries. Let’s get to work play! Here you go, step by step, the techniques I’ve learned to obtain a flaky whole grain crust. Before you begin, gather the tools you need. Pie making isn’t brain surgery, but it’s so nice to have the tools and utensils that you need handy, and not have to stop and hunt for a measuring spoon or a spatula. These are the tools that will make your baking quicker and easier. You absolutely must have measuring spoons and cups, a pie plate, and a mixing bowl, but if you don’t have the other tools, think creatively. No sifter? Use a wire whisk to aerate and mix your dry ingredients. No rolling pin? Fill a tall stainless steel water bottle with cold water, cap it tightly, and roll out your crust. Invest in the real thing as soon as you can, because good tools make the job faster and easier. See that last one? When you check your ingredients, right away, you’re reminded to chill a cup of water so it’s ready when you need it. 3. Cube and soften your butter. If you’ve ever made a pie crust before, you may think I’m daft to use soft butter. Like many home cooks, I learned early on to chill all my pie making ingredients and utensils before taking another step in the kitchen. Then I ran across this trick from Maria Rodale, when she shared the secret of her pie-baking friend’s fabulously tender and flaky crusts. She said she always starts with soft, room temperature butter. Now, I spread it with a knife here to show you how soft the butter is, but keep it in cubes for making your crust. After she’s cut the fat into the flour mixture, she chills it all, in the bowl, for 30 minutes before adding the liquid. It works! The crust is more tender and flaky than many a white-flour crust! According to the Weston A. Price Foundation, on Mercola.com, butter makes the flakiest, tastiest whole wheat crusts. They also explain why vegetable oil makes a tougher crust, and why butter is healthier than shortening or margarine. I can attest to the oil making the crust tough. I experimented with oil for years before I finally returned to buttery crusts. Now, my mom always used lard for her pies, but I don’t have access to good lard from pastured cows, so I use organic butter from dairies I trust. Vegan? Cold-pressed, unrefined, virgin coconut oil is my go-to when I make a pie for my vegan family members and friends. To me, the pies don’t taste quite as good, but they do turn out just as flaky and tender. I use slightly more than a third cup of coconut oil, as you don’t need quite as much as you do butter. Use a large tablespoon to spoon the flour into your measuring cup. This aerates the flour, which helps to achieve a flakier crust. 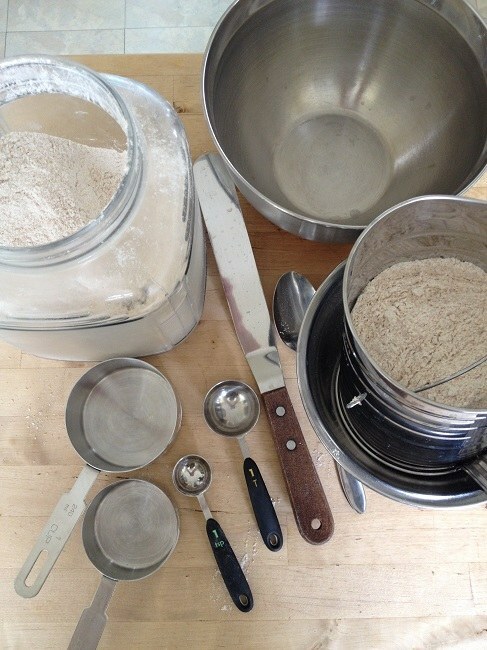 Scrape a metal spatula or other straight-edged tool across the top of the cup to level off the excess flour. If I’d had a third hand on me, I’d have scraped the flour right into my flour canister like I always do, but as I have only two hands, and one was holding the camera, you have to imagine that part. 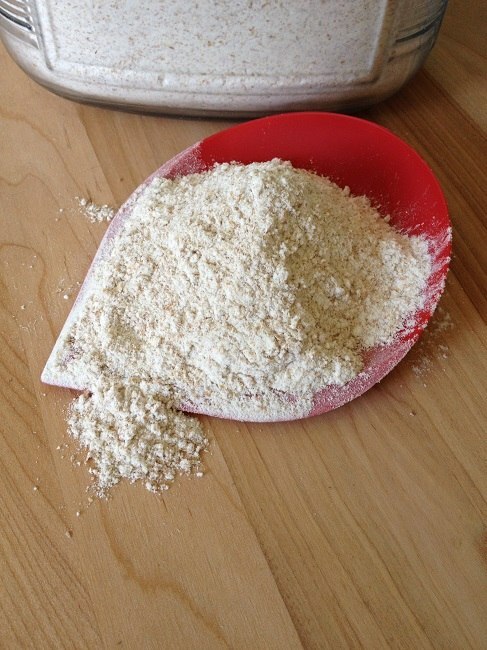 Pour your measured flour into a sifter over your mixing bowl and sift. The sifter mesh is too fine to let the bran through, but we want its goodness, so go ahead and dump that bran into the bowl with the flour. Isn’t that something? You get a tablespoon or so of heart-healthy vitamins and fiber in that bran. When you’re enjoying something as rich as pie, you need every bit of healthy goodness you can build into it without sacrificing mouth-watering delight. Would you agree? Next, using your dough scraper, carefully pour the sifted flour back into the sifter, because you’re going to sift it again, with the other dry ingredients this time. Measure and add the sugar and salt right into the sifter. Sift all into your measuring bowl, and once again add the bran that doesn’t make it through the mesh. With a fork or wire whisk, mix the bran evenly into the dry mixture. Why sugar? Not all pie crust recipes call for sugar. You can omit this if you like. It’s not so much as to make the crust sweet, but I think it gives the crust a little extra crispness. Plus, it helps the surface of the crust to caramelize prettily. Cut the butter into the dry ingredients until the largest pieces are about the size of a small pea and the mixture resembles a lumpy cornmeal in texture. Use a rolling motion with your pastry cutter and turn the bowl as you work. This should take no more than two to three minutes. Cover and refrigerate the flour and butter mixture. Chill thirty minutes. Meanwhile, if you haven’t chilled a cup of water already, chill it now. If you think thirty minutes isn’t enough chill time, place the water in the freezer. Just remember to take it out before it solidifies, something I’ve forgotten a time or two! Now that your dry ingredients are thoroughly chilled, moisten the dough just enough to hold it together. One at a time, add 6-8 tablespoons ice water. Between each tablespoon addition, toss the dough with a fork, until the mixture is just moist enough to hold together when you squeeze a bit in your hand. 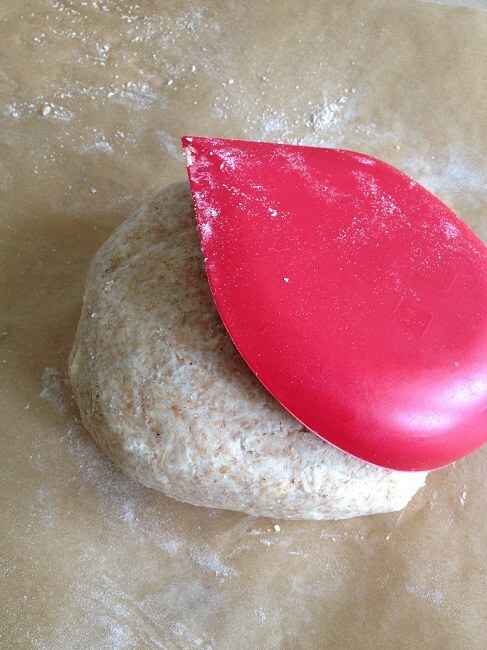 Using your dough scraper, quickly press the dough into a rough ball shape while still in the bowl. Then turn it onto a piece of parchment paper, lightly dusted with a sprinkling of flour. Knead the dough three or four times, quickly, so as not to warm the butter with your hands. Do not overwork the dough! You want to bring it together into a cohesive unit, but you don’t want to melt or crush the butter too much. It’s those little pockets of butter that will make the flaky texture in baking. 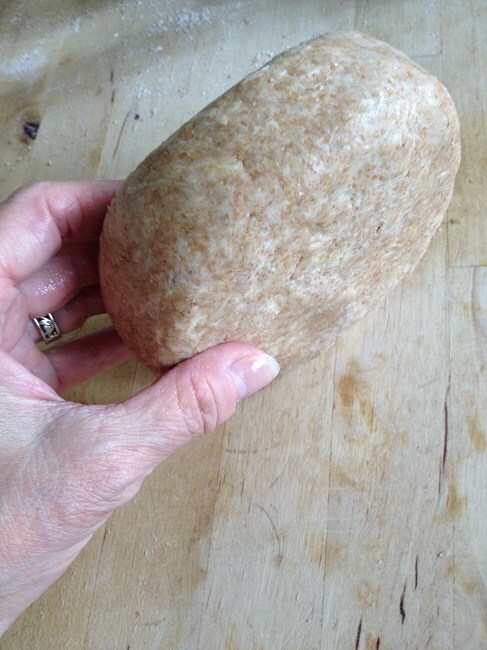 Shape the dough into a disk and flatten it slightly, so it is about an inch thick. 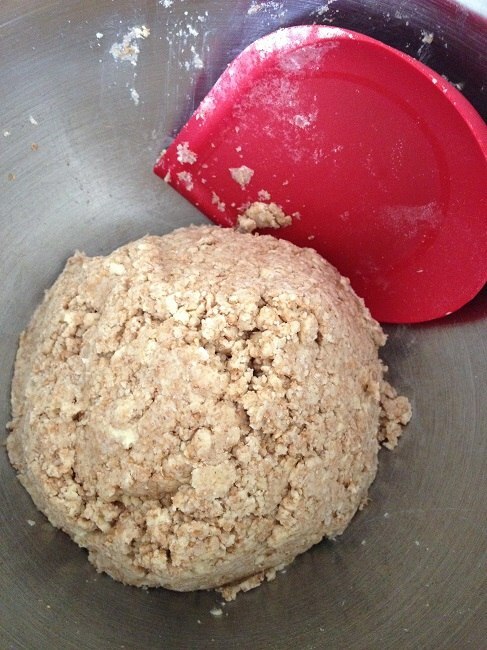 Turn the dough on its side, like a wheel, and roll it back and forth across the counter top or table in long strokes. This helps to keep the edges from breaking apart when you roll out the pie crust. Until I learned this trick, when I rolled out the crust, it would tear, with cuts deep into the circle. I always had to paste the bits together in the pie plate. Not any more! Lately, I’ve had to cut time corners and have eliminated this step. I haven’t noticed a speck of difference in the outcome, so I’m taking it out! Woohoo! Thirty minutes saved! 12. Roll your pie crust! Yes, finally, it’s time to roll, Baby! Open the parchment paper and very lightly dust both parchment paper and dough with flour. Be sure to dust the parchment underneath the dough disk. I like to use a tea strainer or a small mesh sieve, so I get a nice even but very light sprinkling of flour. 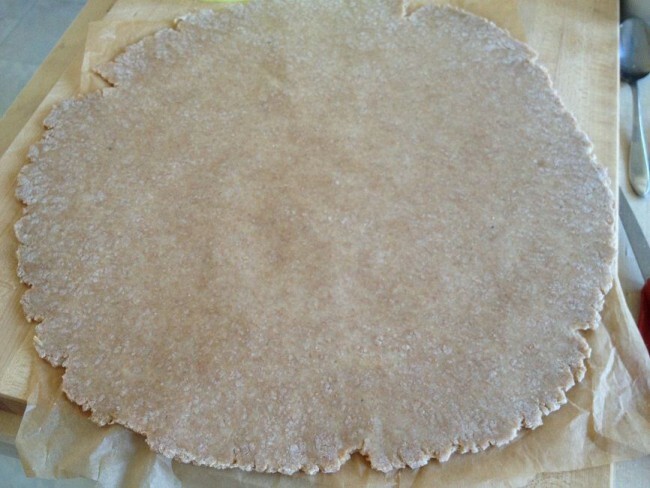 Lay your rolling pin on the center of the disk and roll away from you, to the edge of the disk. Do not roll backwards! Roll away from you, lift your pin, turn the parchment a quarter turn, and lay the pin once more in the center of the disk and roll away from you. Repeat. This may seem tedious, but it’s the best way to get a nice, even, flat disk. Continue turning and rolling, applying only a whisper of pressure. Your goal is to let the pin do the work, not your arms or your strength. At first, it may seem as though the dough is not beginning to stretch and flatten, but keep going. Soon the circle will begin to shrink in height and expand in circumference. Then, almost magically, you’ll find you’re getting a thinner and thinner wheel. The goal here is to work gently enough that we keep those little fat globules between layers of flour. They make the flakiness that is so tender and delightful on the tongue. From time to time, lift the disk and flip it over. This helps to keep the pastry from sticking to the parchment. It also helps produce a more even disk. If necessary dust lightly with flour, but only enough to keep the pastry from sticking to pin or surface. Be careful not to add so much flour that the dough becomes dry. Roll the dough to about two inches larger than the widest diameter of your pie plate or quiche pan. You need a disk large enough to fill the bottom and sides, with dough hanging over the edge for trimming and fluting. Once you’re experienced with rolling out pie dough, you can eliminate the paper underneath. You’ll find you don’t need it after all. 13. Lift the dough and roll it into the pie plate. Carefully roll the dough away from the parchment and onto your rolling pin. Lift the rolled dough quickly over the pie plate, center it and unroll. Gently help the pastry to settle into the contours of the dish. Trim the edges with your kitchen shears, leaving about a half-inch overhang. Working quickly, turn the edge under all the way round. Crimp or flute the edge. For a quiche like this, I simply help the dough to conform to the quiche plate. For a pie plate, I make a scalloped edge by gently pushing the dough with two fingers against the broad side of my thumb. Prick the bottom of the pie shell lightly with a fork here and there. This helps prevent bubbles lifting the crust while baking. Use those dough scraps to make a sugar pie. Or press them into a custard cup and make a quick tart with whatever fresh fruit you have on hand.Mix the fruit with a little sugar and flour, dump it in the dough-lined cup, top with any bits of crust left over, and voilà! A sweet treat to nosh when ready. Sometimes, if I have a little leftover stew in the fridge, I’ll pop it into the crust and make a savory pot pie to freeze for a quick meal on a cold day. That’s it! If you are making a fruit pie, fill and top as usual. If you are making a quiche or cream pie, and need a pre-baked crust, continue with the following steps. If you’re making a quiche, or a custard or cream pie, you will want to par-bake it before filling. Continue as follows. 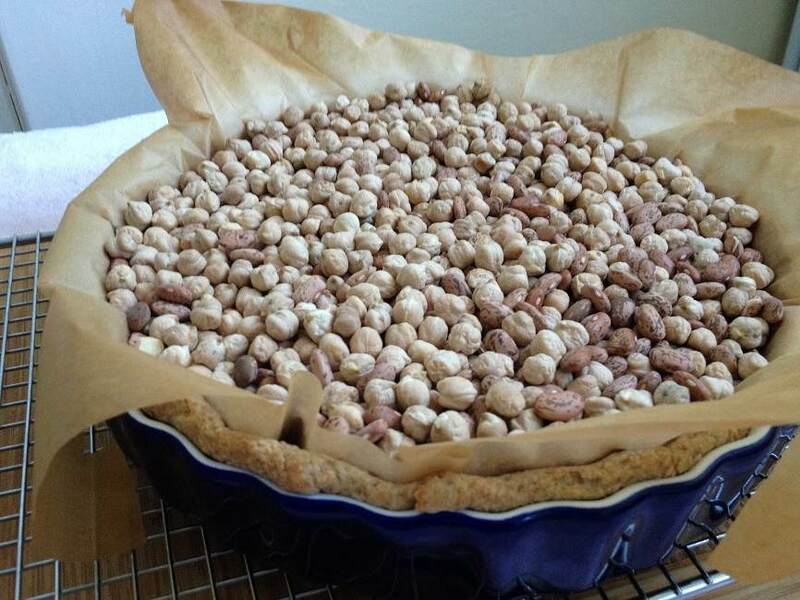 In addition to the pie plate and a square of parchment paper, you will need enough dried beans or pie beads to fill the plate and a cooling rack. 1. Preheat the oven to 450º Fahrenheit (F). 2. Line the unbaked crust with a piece of clean parchment paper with plenty of overhang. 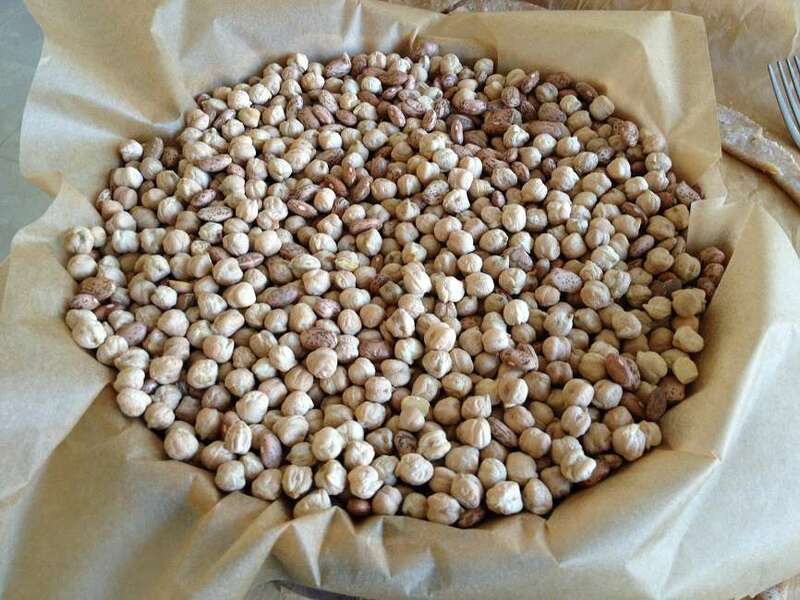 You need enough to draw the parchment together after baking, so you can lift the beans from the plate. You can use the parchment paper in which you wrapped and rolled the dough. Just dust off any bits of dough before you place it in the pan. This step is another one you can dispense with as you gain pie-making experience. 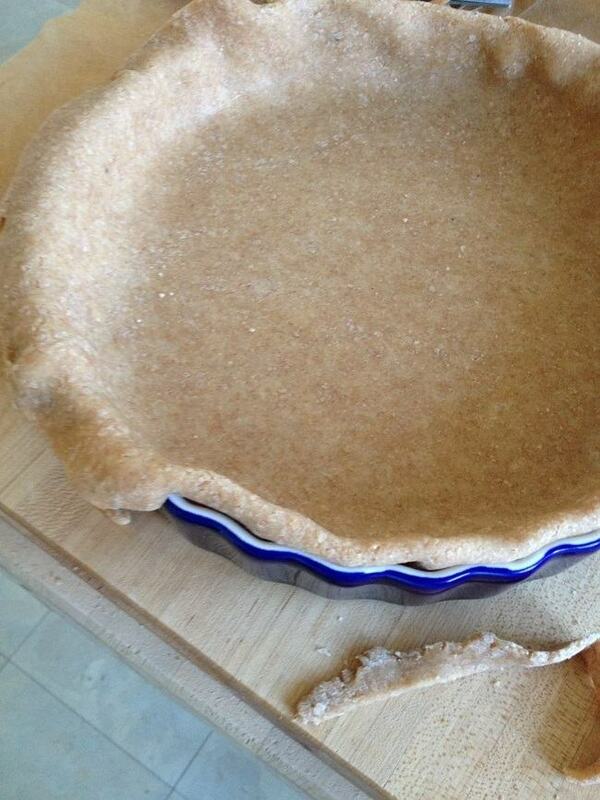 In the beginning, it helps to keep your pie crust flat and the sides from collapsing. Later on, when you understand the dough better, you’ll find that pricking the crust with a fork in one-inch intervals will do the same thing, as long as your dough is moist enough but not too moist. 3. 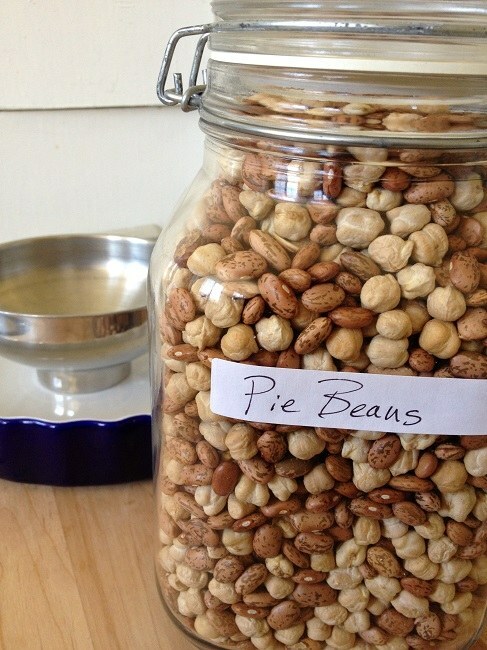 Fill the plate completely with pie beads or use dried beans you save just for this purpose. I have a stash in a large Fido jar that is enough to fill two 9-inch pie plates. Why do you need pie beads? Without the support of the pie beads, a buttery crust like this can collapse when the butter melts if the ratio of moisture and flour are off a little. With experience, you’ll find you don’t need these any longer. 4. Check your oven temperature with an oven thermometer to assure proper baking, and bake at 450°F for 10-12 minutes, until crust is set and just beginning to brown. Remove from oven and cool on a wire rack completely before lifting beans or beads from the shell. 5. Test the parchment. Heat weakens it, and it may tear if you try to lift all the beans out at once. Use a large, shallow spoon to scoop some beans, until you feel the parchment can hold the rest. Then lift and pour them into your container. A wide-mouth funnel, like the one that comes with your canning supplies, makes easy work of pouring, so you don’t end up with beans all over the floor! 6. Add your filling–quiche, custard or cream–and bake according to your recipe. 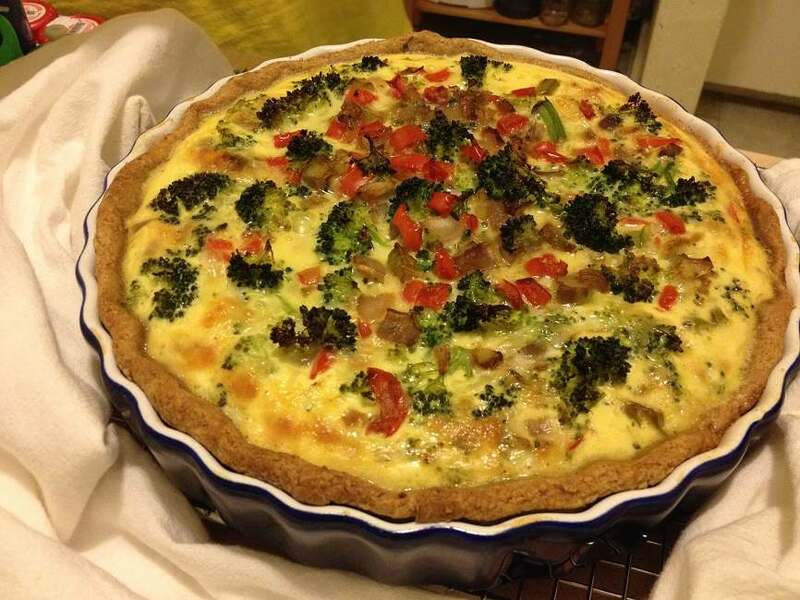 This is one of our favorites, a broccoli and red bell pepper quiche. Recipe coming soon! Did I leave anything out? Is something not clear? I invite you to ask any questions you have about this method. Or just tell me how it works for you. Of course, if you have a pie-baking tip you love to share with novice bakers, please take this opportunity! I’d love to hear from you. So much detailed info but where is the measurement for ingredients? Hi Jackson. Welcome to my kitchen. This page is a tutorial, or how-to, and, I expect, can be used with any whole wheat pie crust recipe, so I didn’t include my tried and true favorite here, though I did include a link to it on this page under the section titled “Sharing What Works,” near the top of the page. 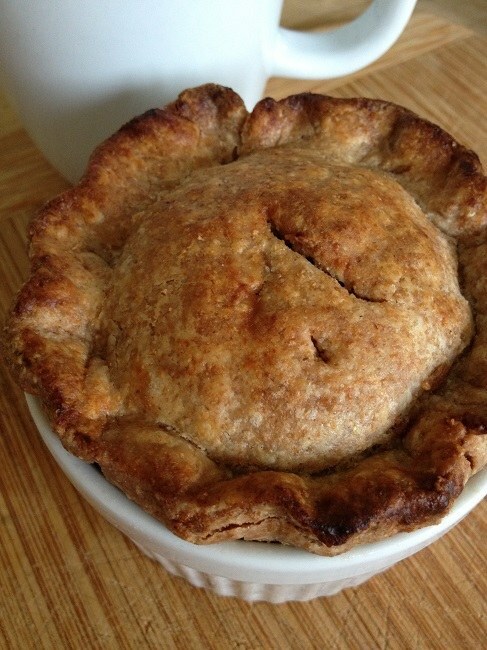 Or you can hop over there from here: Tender, Flaky, Delicious Whole Wheat Pie Crust Recipe. If you try it, let me know what happens, won’t you? Just a note to let you know that I have chosen your post as one of my features for this weeks Real Food Fridays blog hop that goes live every Thursday @ 7pm EST. Thank you for being part of Real Food Fridays mission to help make this a healthier world. Marla! Once again, I am honored and ever so happily surprised. Thank you! I make my pie crust very much like yours but I started using coconut oil instead of butter and I do it at room temperature – no ice water. I also use a Kitchen aid do mix the dough which makes it so much easier and quicker to mix and mixes thoroughly without so much work. Never understood he need for the ice water myself. The quiche looks fabulous. Thanks for sharing on Real Food Fridays. Pinned & tweeted. Have a healthy happy blessed Thanksgiving. Hi Marla, thanks for sharing your tips. As I mentioned in the box way up there, I use coconut oil when I’m making a vegan pie crust. We just don’t enjoy it quite as much as we do the butter crust, but nearly so! I’ve never attempted mixing my pie dough in a mixer, but then I never make more than one or two crusts at a time. It would take me longer to clean the bowl and beaters than it takes to mix the dough! But if I were making several pies, that could be mighty helpful. I find the ice water helps the fat stay cold and hard better than room temperature liquid, especially if I’m using coconut oil, which melts so much faster than butter. Thanks for all your tips. I love seeing how other home bakers do things. Don’t you? I love the way you always give such clear written and visual instructions for your recipes. I haven’t made a pie in years because we’re really not supposed to eat wheat of any kind anymore, but reading this tempts me to try it. Thank you, Barbara. I so much appreciate your stopping by. Next PostWhy do we need salt in sourdough bread?